Chicken tractor 0.5 beta was a little bit of a problem. After severe raccoon predation is was incrementally hardened to make it predator proof. Unfortunately it was then too heavy to move. 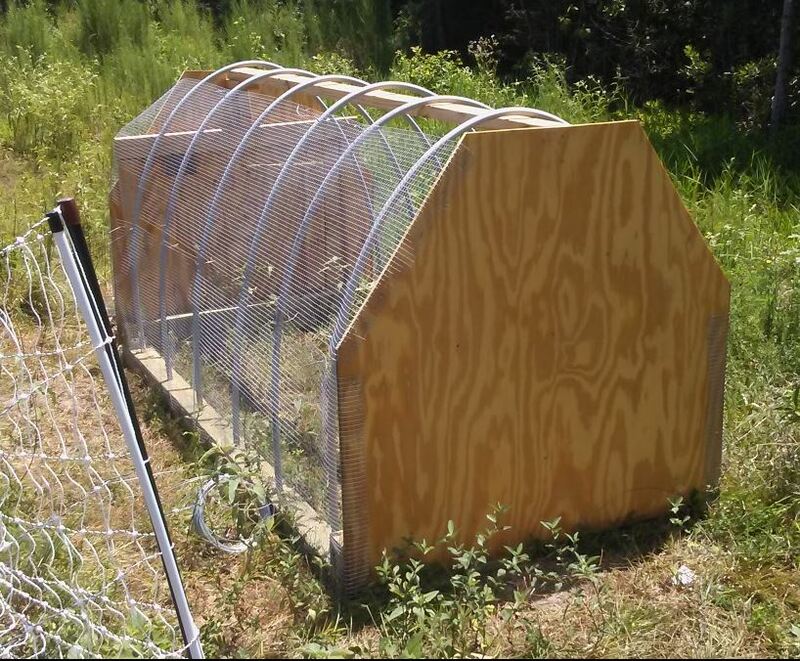 Less of a chicken tractor, more a chicken fort. Thus a new design was necessary. This design sits in an electric netting fence with raccoon trap outside, reducing some of the need for security. But this new design appears secure too. The ground is very rough currently as this is the first pass over the pasture. The initial design was not very stiff on the long axis which made it more difficult to move a the frame was prone to twisting. Version 2.0 was based on 4×4 runners to form the sled held together with ledger screws and stiffened with metal brackets. The initial size is 4ft by 8fh. This will be increased to 4ft by 12ft. Roof supports were formed by running a central 2×4 with ribs of 2 inch exterior PVC electrical ducting. This made an arc of 9ft. The ribs were covered with 2″ galvanized hardware mesh in 2ft widths, ie 5 runs. The Texas summer can be harsh, so shade was provided with landscape fabric over the rear portion of the tractor. Holes have been drilled through the 4×4 at the rear to allow insertion of or re-bar axles. Wheels can be slipped on at the time of each move.